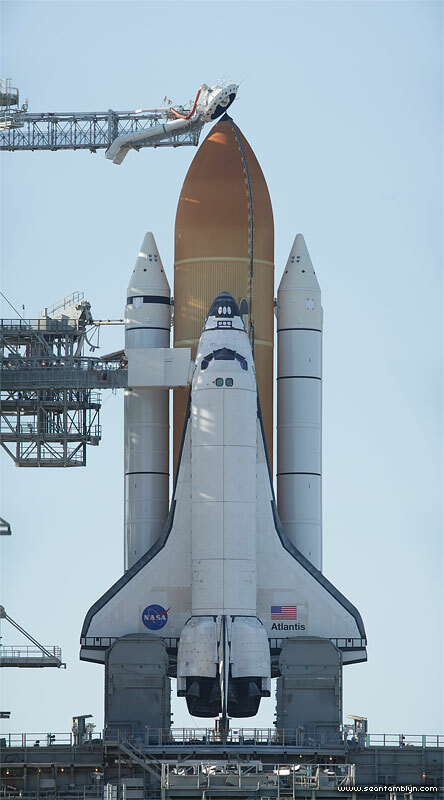 Space shuttle Atlantis, STS-132, stands revealed on the launch pad after rollback of the Rotating Service Structure, the day before her ‘first final flight’. This is a small detail from a several hundred megapixel final composition. This entry was posted on Friday, January 13th, 2012 at 6:02 pm. It is filed under Areas, STS-132 Atlantis, The Space Shuttle Project and tagged with Canon EF 70-200 f/2.8 L IS, Canon EOS 5DmkII. You can follow any responses to this entry through the RSS 2.0 feed.